The Olympics may be making everyone go for the gold, but personally I'm all about silver right now. 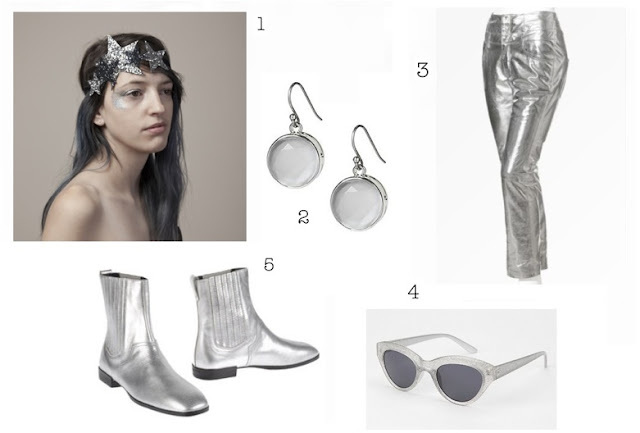 I seriously can't get enough of it - not just in jewelry, but I want silver everything. Silver clothes always remind me of Edie Sedgwick modeling for Betsey Johnson back in the Paraphernalia days. That mod fascination with the space age is now so simultaneously futuristic and retro, I love it. 1. Crown and Glory Intergalactic Starlight Crown: I love this pewter crown - it reminds me of a photo of Linda Morand wearing a similar star headpiece. I feel like this is a really versatile piece - you could wear it with a printed maxi dress and be a moon child, or style it with a mod shift dress, or even an all black leather outfit and be super rock 'n roll. However you wear it, glitter to the face is a must. 2. Banana Republic Bezeled Drop Earring: I would wear one and pretend I'm Zenon. 3. Theyskens Theory Postel Pant: These pants are really kind of ridiculous but that's why I love them. 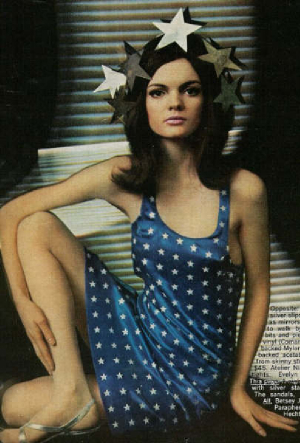 Pair with a silver bandeau to LOOK EXACTLY LIKE EDIE SEDGWICK. 4. Urban Outfitters Glitter Cat Eye Sunglasses: I am the self-proclaimed spokesperson for cat eye frames. My love for them know no bounds. These are a bit Miu Miu-y (always great) and really sparkly (always amazing) and are an absolute steal. 5. Hogan Ankle Boots: I don't think I could begin to explain how amazing I think these boots are. So I really think these shoes are quite Warholian, I can also envision Françoise Hardy wearing these too. Basically these are the most incredible shoes ever. Some fantastic items here. Summer always makes me think of silver too, of mermaids, the sea and light on the waves. Those silver ankle boots and the flower crown are AMAZING. Something tells me a major glitter phase is about to happen in my closet a la Marc Bolan.